NAUGATUCK — The Connecticut Custom Car, Truck and Motorcycle Show will return to Naugatuck this weekend. 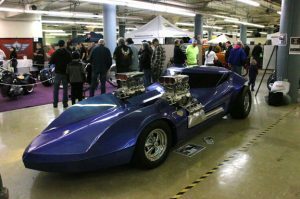 The show is at the Naugatuck Event Center, 6 Rubber Ave., from 10 a.m. to 7 p.m. Saturday and from 10 a.m. to 5 p.m. Sunday. The show, which is sponsored by the borough and Connecticut Cruise News, will feature a variety of vehicles including a U.S. Air Force tribute Jeep, The Walking Dead and Avatar themed motorcycles, and a Scarface themed car. The event will also feature vendors, music, food, and an auction for a custom made 1966 Chevrolet Chevelle. Mayor N. Warren “Pete” Hess said the show was poised to be larger than the Cabin Fever show the borough hosted in March. “We have more space. We are going to have more vendors. We are going to have more excitement,” Hess said. Hess encouraged people to come down to check out the variety of cars and do some shopping with the vendors. “This is a perfect opportunity for pre-Christmas shopping for gearheads,” Hess said. Tickets for the show are $10 for general admission, $5 for children ages 8 to 13, and children 7 years old and under are free.